One day, in September, I retrieved the ‘saved’ Duplo from the shed. This mixed origin Duplo had passed through the hands of several children, I had no idea how much or what there was. It had been in the shed for at least seven years. It was, to say the least, a little dusty. 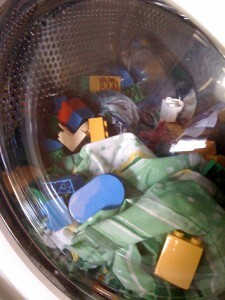 Not wanting to actually hand scrub each primary coloured piece, I googled washing Duplo in the washing machine. Yes, really. And guess what? Other mothers had been there before me. There were instructions! I put all the Duplo into a pillow case, tied a knot in it and stuffed it into the washing machine. So far, so good. All was fine. It was clanking around but getting clean. But then it escaped! It crashed noisily around in the washing machine for what felt like hours. When the Duplo washing finished, I found the Duplo toilet and hand basin! Amazing! Who knew there even was such a thing as a Duplo toilet! I was rather excited, so I tweeted about it. 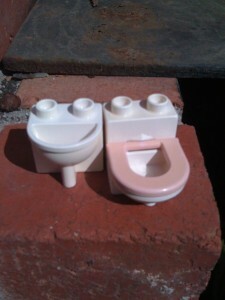 What I didn’t know was that the tweet – “I found a Duplo Toilet” – would start a beautiful friendship. “Where?” asked @mamabook. “In the shed!” I replied – as if everyone would keep seven year old Lego in their shed. We had an instant connection @mamabook and I. She gave sage and wise advice. As a mother of four children she was practised at maximising her downtime and doing things for herself in any spare minute she could manage. She told me to read the paper and drink coffee while the child sleeps and not to do the housework. I was, and still am, very bad at this. 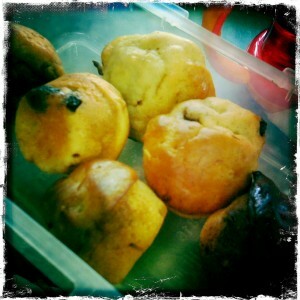 I am, however, getting better, thanks to @mamabook’s excellent example. She jealously guards her free time, to keep herself sane, so she can, in turn, be a better mother. Her lovely children are a testament to her success as a mother. We conversed about many many topics, children, politics, books, the world and everything in it. We cracked each other up. This was a danger to her for a while, as her avatar was an egg. Many many egg jokes. We saw each others’ ups and downs through the little window on the world that is Twitter. I had started my blog but was only really just getting going. Then @mamabook started hers, 4 Kids, a dog and a blog and the excitement of posting and receiving replies was a shared joy. We furiously promoted each other’s writing. We talked and talked and talked. As our holiday to the Cook Islands neared, I discovered that we were staying the night with friends before our flight, extremely close to where @mamabook actually lived! She invited me to pop-in. At this stage we were pressed for time and trying to travel with an almost one year old, but I promised to catch up when we came back to Sydney. We arranged before our recent trip to Sydney, to meet up IRL – to actually meet, in real life! #brazilliant, as we say on Twitter. We met up at the Powerhouse Museum with our children in tow; six of them in total. The age range was from one to thirteen. We were both a bit concerned about the big gaps but the children were all completely fine and had a great time – particularly while they all stuffed themselves with *cough* chips and homemade chocolate muffins. Michelle, for that really is her name, in real life, Robert and I, talked and talked while directing kids around the place. Later on, when Robert confessed to The Talking Boy that neither of us had met Michelle before, he was flabbergasted. He was amazed we hadn’t actually ever met. We had, of course, because we had ‘talked’ everyday. We have shared joyful moments, triumphs, stupidity, silliness and dreams of true idle parenting (the kind where the parent really is idle – not just pretending they are!) We knew and liked each other a great deal before we actually met, thanks to the magic of Twitter. Next time you step on a piece of Lego, or buy one for a child who has everything, consider this; sometimes a Duplo toilet can be the start of a beautiful friendship.